Music director candidate Mei-Ann Chen returns to DeVos Performance Hall to lead the Grand Rapids Symphony in Dvořák’s Seventh on January 29-30. The dynamic music director of the Memphis Symphony Orchestra made her debut here in March 2014 to lead the Grand Rapids Symphony in Aaron Copland’s “El Salon Mexico” and William Bolcom’s “Games and Challenges,” featuring the eclectic string trio, Time for Three. 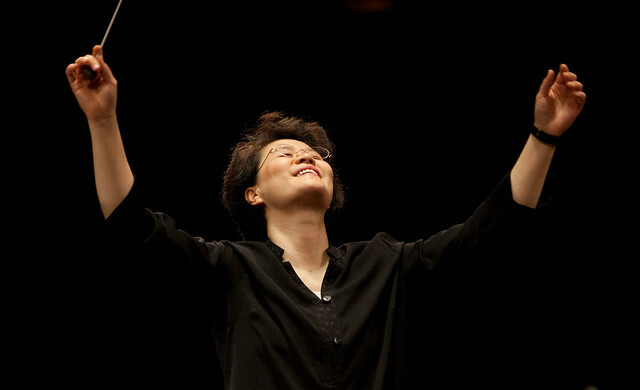 The Taiwanese-born conductor explains why Antonín Dvořák is her favorite composer and what it was like to meet the granddaughter of Erich Korngold, the 1938 Oscar-winning composer of the film score to “The Adventures of Robin Hood,” whose Suite from “Much Ado About Nothing” also is on the program. You have collaborated with Karen Gomyo before at a performance with the São Paulo Symphony Orchestra in Brazil. Can you describe that experience? What can audiences look forward to in a performance from Gomyo? I had witnessed Karen's wonderful performances on several occasions before collaborating with her for the first time in Brazil, so I knew of and admired her talent before working together. Leading up to both our debut with the São Paulo Symphony Orchestra, Karen had appeared with many orchestras that I had recently guest conducted. Literally everyone raved about her music making and also her personality. Karen was such a joy to work with during our time in São Paulo. The rehearsals were fun and the concert most memorable - all this while she was battling the flu (which she unfortunately picked up during the long international flight to Brazil)! Karen was not only a trooper through all the performances, she kept the audience on the edge of their chair while tackling the challenging Britten Violin a Concerto for the first time. You’ve said that Dvořák is your favorite composer. What about his music speaks to you so strongly? I grew up with Dvořák's symphonic music even before I knew much of the historic aspects for all the composers, so Dvořák's music to me is almost like a native language. Perhaps it is his unique way of writing - so folk-tune-like in its memorable nature, yet it is distinctly Dvořák's own voice when compared to other composers who also adopts folk element in their writings, such as Bartok, Vaughan Williams, and Stravinsky. Dvořák is a very tuneful composer and the Bohemian rhythms are always catchy and dance-like - it may sound simple but melody and rhythm are two most essential elements for great music and Dvořák has such a handle on them! When you were conducting in Portland, you met the granddaughter of Erich Wolfgang Korngold, a composer’s whose work you will be performing at the Grand Rapids concert. How did that experience inform your perception of Korngold’s work? I am forever grateful that I was introduced to Korngold's music because his music is simply wonderful - and in my opinion should be appreciated much more in concert halls. Most American audiences will likely to view Erich Wolfgang Korngold as a successful film composer from Hollywood. However the sad truth was that his unique style of orchestration and musical sound had always been true to himself and he was most likely to become the very successor to Richard Strauss or Gustav Mahler if the war hadn’t forced him to leave his native Austrian and to settle in Los Angeles. Knowing Korngold's family during my Portland tenure made it even easier to champion Korngold's music as they are just such lovely people (it's almost as if one gets to know the composer through them somehow)! When did you first realize you wanted to pursue a career in music? My parents want me to fulfill their music dream of becoming a concert violinist, but I was so clearly drawn to conducting when I played in the orchestra for the first time at age 10. I ran home to tell my parents that while violin and piano are fun instruments to learn, I want to be a conductor! I knew at age 10 that I wanted to help "play" the largest instrument I just discovered - a symphony orchestra! What is something you like to do in your spare time outside of music? My absolutely favorite thing (outside of music) are detective stories! I love to solve crimes and often I am able to transfer detecting skills to analyzing musical scores which have wonderful cues left behind by the composers. What are you most looking forward to during your visit to Grand Rapids? I had a fantastic first visit before - such a welcoming and supportive city with the most fantastic and friendly musicians! It doesn't get any better than this kind of magical combination, so I am very excited to return to Grand Rapids again.